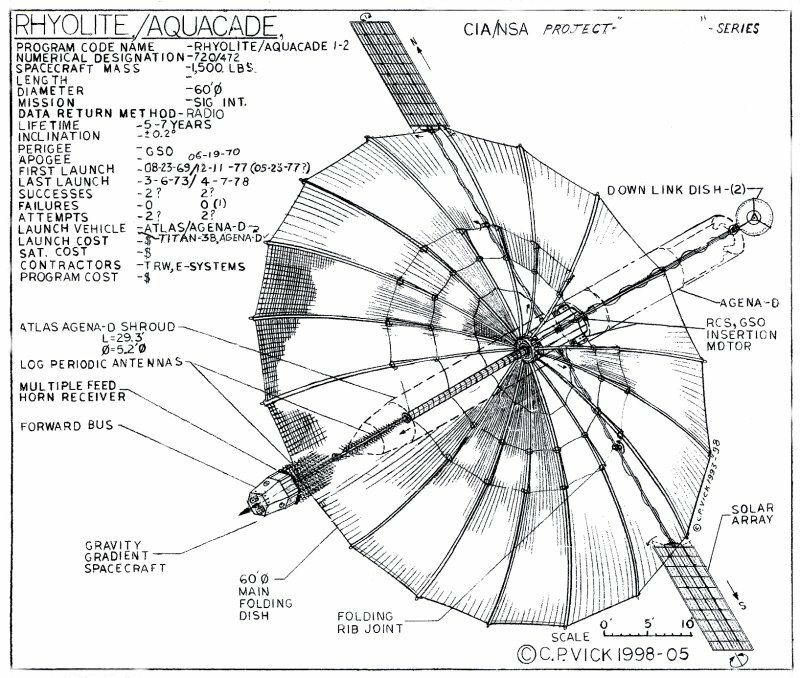 Code name RHYOLITE / AQUACADE was the next in a long series of earth orbit CIA/NSA, SIGINT (signals intelligence) spacecraft used by the CIA and intelligence Community for a variety of mission. They were launched by the stretched Atlas-3A Agena-D and Titan-3B Agena-D series boosters with a total of at least two launches each of four successful launch attempts total. The spacecraft were actually nothing more than CIA specific sophisticated earth orbit space based earth receiving stations operating over the entire emitted electro magnetic radio spectrum frequency range. 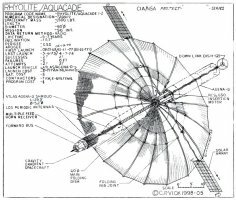 The RHYOLITE introduced the first CIA specific large deployable fold out gold mesh covered receiving dish antenna design of about 55-60 feet in diameter with a total spacecraft mass of about 1,500 pounds. RHYOLITE’s first known launch was apparently June 19, 1970 and its last launch was apparently March 6, 1973 before the series was continued as the AQUACADE-1 launched December 11, 1977 and the last launch in the series AQUACADE-2 launched April 7, 1978. They were designed to monitor and pick up from the ground and in flight electronic signals intelligence (ELINT), radio, communications intelligence (COMINT) and radar emitters emissions intelligence (RADINT) in addition to the primary missile test telemetry intelligence (TELINT) acquisitions capabilities all coming under the general SIGINT heading. Its primary mission was TELINT intercepts of Soviet missile flight test telemetry traffic across the former Soviet Union missile test ranges out into the Pacific Ocean. They were fully dedicated mission operations that were highly successful in acquiring SIGINT through the larger mission general SIGINT reflector dishes. The technology for these SIGINT spacecraft were slow in coming on line development wise but later proved out highly successfully once the technology was perfected. Like any new technology program it had its issues that slowed its initial progress. During the era they were developed it literally became a serious chase to just keep up with the developing different kinds of monitor able electronic emitters emissions that these systems were able to monitor crying for larger more sophisticated systems able to do multiple missions at the same time. Each gravity gradient stabilized spacecraft was about 55-60 feet in diameter with the dish attached to gimbals for steering from the command, communication, control and intelligence, power bus. RHOYLITE’s dish did not cover the entire visible surface of the earth but covered more than its CANYON predecessor and thus the dishes were presumable set on gimbals to monitor specific points or objects of interest such as ballistic missile flight test telemetry. This would thus require several spacecraft to accomplish this monitoring task over the full range of the ICBM’s flight test. It is presumed that each spacecraft bus carried two solar arrays and at least one down link communications dish. The launch shroud was 5.2 feet in outside diameter while it’s inside diameter was 58 inches with a total length of 29.3 feet. Under the fairing shroud nose cap was the part of the spacecraft which housed the sophisticated receiving feed horns with log periodic antennas collecting the earth based signals reflected off the large SIGINT dish. Above the feed horn’s apparatus housing there was no adjunct ballistic missile early warning sensor payload system like carried on similar air force payloads. This spacecraft utilized the five foot diameter by 20.86 foot long Agena-D based stage to place it on a geosynchronous transfer orbit that then became a geosynchronous orbit once the spacecraft bus housed orbit insertion solid motor was fired to placed it in that kind of orbital position. They were operated at an inclination that was at approximately 0.2 degrees with a perigee of 35,670 kilometers and an apogee of 35,860 kilometers with a spacecraft life of five to seven years. The CIA primarily utilized it for monitoring Soviet missile telemetry emissions. The Agena-D rocket stage portion of the SIGINT packages carried the usual assortment of earth, horizon and solar sensors to orient the spacecraft but it did not remain attached to the spacecraft. The constellation of spacecraft was able to receive and send the data to several global ground stations via radio signal operated by NSA/CIA personnel. The data was then processed and analyzed at NSA headquarters for further analysis distribution to the CIA intelligence community. 1. Pike, Christopher Anson, “CANYON, RHYOLITE and AQUACADE,” Spaceflight, Vol. 37, November 1995 pp. 381-383. 3. Day, Dwayne A., Ferrets of the High Frontier, Spaceflight, Vol. 46, February 2004, pp. 75-81.